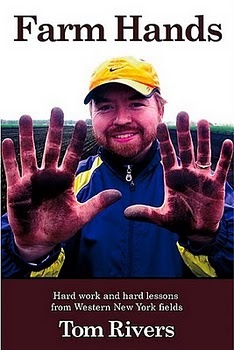 Agricultural reporter Tom Rivers "gets his hands dirty" and describes his farm work experiences. When I was a kid, I was fascinated by George Plimpton. (Yes, I am that old.) George started out as a sportswriter and ended up being, well, everything. The book that launched George on the trajectory that would define the rest of his career was the best-selling “Paper Lion.” In 1963, George trained as a backup quarterback with the Detroit Lions and then he wrote the book about the experience. OK, I was six when that book came out. But it was the George Plimpton of the 1970s whom I remember, whom I wanted to be. In a series of “Plimpton!” specials on ABC television that today would be called “reality TV,” George tried his inept hand at all sorts of jobs including circus performer, race car driver, stand-up comic, and boxer. “Yes! That’s what I want to do!” I thought in big exclamation points in my boy brain. “I want to be a writer so that I can do anything, be mediocre at it, make no long-term commitment to it, and be richly rewarded with fame and fortune for it!” Yeah, it seems funny now. The way that whacking your funny bone on the edge of your desk while reaching for yet another cup of stale coffee in a chair-bound sprint for a publication deadline is funny. So it seems that Mr. Rivers, while a staff writer covering the agriculture beat for the The Daily News of Batavia, New York, wrote a series of articles about his experiences at trying his hand at all sorts of jobs in the orchards, fields, and barns in and around Orleans and Genesee counties, the heart of New York’s farm country. That series of articles became the basis for his book. Imagine my envy and wistfulness. Tom Rivers had done it. He had achieved Plimptonhood. Or at least that’s what I thought until I read Farm Hands, a highly readable and engaging first-person account of the back-breaking work that virtually no American is willing or capable of doing but that foreign guest workers (documented and otherwise) do with a work ethic worthy of the highest respect and admiration of anyone who eats as a habit. And here’s why Rivers is no Plimpton. Rivers is competent. He does pretty well at each of the various jobs that he attempts. True, not as well as the seasoned farmhands who often leave gift piles of cucumbers in his row or let him toss cabbages into the tractor’s bin to give him a break from the hand-numbing, digit-amputation-threatening chore of cabbage harvesting which requires a deft and determined inward stroke of a sharp curved knife to behead a cabbage from its tough stalk. Despite Rivers’ almost pathological inability to arrive at a work site equipped with the proper gear for that particular day’s job—no gloves, no rubber pants, too short boots, no hat—Tom actually acquits himself quite respectably. No doubt to the disappointment of the veteran foreign workers whom were thereby deprived of the sweetest of sports—deriding the American in a language he couldn’t understand. But their possible disappointment is the reader’s good fortune. I don’t think I would have enjoyed Farm Hands if it had been merely a fish-out-of-water comedy of errors. Instead, Rivers is able to describe the work accurately with insight into the skills that are needed to become proficient at the task. Here is a partial list of some of the jobs that Rivers tackles: onion planting, cherry picking, night-shift dairy milker, apple picking, pumpkin harvesting, and farm stand tending. Along the way, the reader meets growers, farm managers, and, of course, the seasonal and migrant farm workers that have come from Haiti, Jamaica, and Mexico to earn the money they send back to the families they had to leave to support. Some readers may wish that Rivers had included more of the personal stories of these workers. Understandably, language barriers and the reticence of some workers to talk openly with Rivers about themselves made his access to these stories a challenge. And Rivers does do a great job of capturing the various personalities of his co-workers in quick journalistic sketches. But the final chapter and the epilogue of the book showcase Rivers’ talent as a journalist who knows that, in the words of César Chávez, “it is always about people.” In the final chapter, Rivers describes the lives of the farm workers beyond the fields and orchards. The dream of and the difficult quest for citizenship. The infections, the injuries, and the illnesses that are common in that hazardous line of work. The separation from loved ones, the homesickness, and the cultural stress that are painful exigencies of migrant life. Farm Hands is a great read. I highly recommend it. It is available at www.farmhandsbook.com and at Amazon.